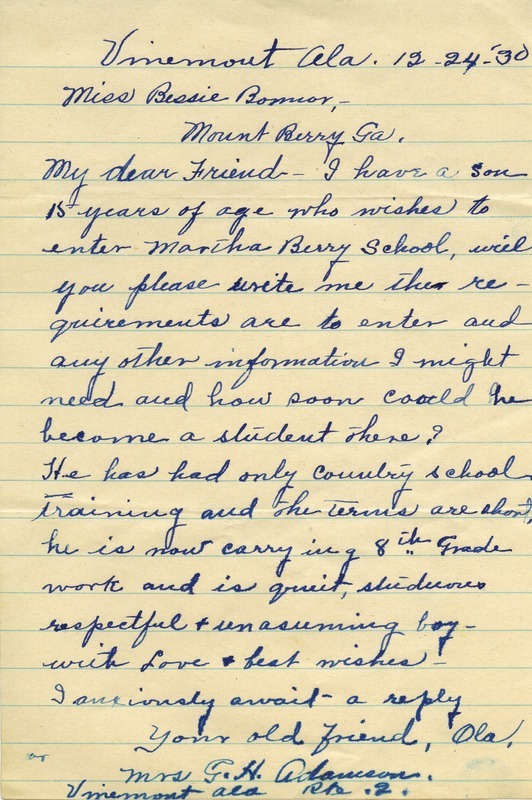 Mrs Adamson writes that she has a 15 year old son that would like to attend Martha Berry's school. She asks for the requirements and any other information she needs so that he may become a student as soon as he can. Mrs. G H Adamson, “Letter to Miss Bessie Bonnor from Mrs G H Adamson.” Martha Berry Digital Archive. Eds. Schlitz, Stephanie A., Alan Henderson, et al. Mount Berry: Berry College, 2013. accessed April 23, 2019, https://mbda.berry.edu/items/show/11613.